Once the epoxy is encased in concrete water and chloride vapors and liquids seep under the paint film thru cracks, pinholes, sheared ends and scuffs caused during handling. 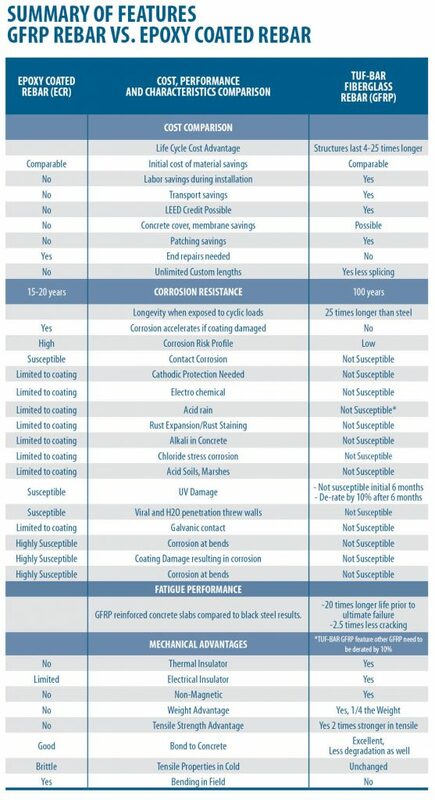 Epoxy Coated Steel Re-bar (ECR) is comparable in price to GFRP and the coating on epoxy re-bar has proven to slow down the corrosion process on steel if it remains intact. Maintaining the integrity of the coating is difficult to ensure during the process of manufacturing and even more difficult to maintain at a construction site. A pinhole manufacturing defect or a scratch that may occur during handling or placement at a construction site will cause an epoxy coated rebar to degrade rapidly. Epoxy coated rebar has been banned in the province of Quebec. Other provinces in Canada and many U.S. States have initiated studies re-evaluating its use. Once the epoxy is encased in concrete, water and chloride vapors, liquids seep under the paint film thru any crack, pinhole, sheared end, scuff caused during handling. The Ontario Ministry of Transportation has a mandate to specify cost-effective methods and materials for the construction and maintenance of provincial highway structures. In support of this mandate, the Bridge Durability Work Group initiated a performance evaluation of epoxy-coated reinforcement (ECR) in the Ontario bridge environment. Findings of the investigation, which are summarized in this paper, strongly indicate that the long-term performance of the ECR is not likely to provide the corrosion resistance or associated maintenance free service life that was originally forecast. Several Ministry structures constructed with ECR have already been rehabilitated, before achieving even a 20-year service life. Today, the Ministry must develop and adopt strategies at the time of design for service life that far exceed the expectations of only a few years ago; typically, in accordance with the new Canadian Highway Bridge Design Code, the design life of new structures is anticipated to be 75 years. A significant body of research to date indicates that ECR can at best provide marginally longer service life than black reinforcement. Corrosion protection service life of Epoxy-Coated Reinforcing Steel (ECR) in Virginia bridge decks. It is apparent that at least some of the existing Epoxy-Coated steel re-bar (ECR) decks in service will not achieve the anticipated design life. Repair procedures and remediation strategies must be specifically developed to address ECR. Some procedures, such as cathodic protection, may not be successfully implemented in such structures. Removing chloride contaminated concrete and installing overlays above ECR that has initiated corrosion may prove insufficient, since corrosion beneath the coating may progress under completely different mechanisms once initiated. Laboratory tests and field inspections indicate that epoxy-coated rebar in a marine substructure application is more susceptible to corrosion than bare bar. The underlying clean bright metal, which does not passivate, as does bare steel when in contact with cement, is highly susceptible to corrosion. No evidence of de-bonding between GFRP and concrete in any structure. Alkali attack could not be detected in the GFRP reinforcement materials. No deterioration of GFRP reinforcement took place in any of the field demonstration structures. Studies indicate GFRP reinforcement degrades very slowly in concrete. 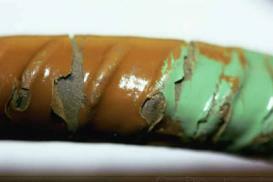 Corrosion rates indicate the reinforcement has a viable life of over 160 year.